The American writer, thinker, and naturalist Henry D. Thoreau was born to John and Cynthia (Dunbar) Thoreau in Concord, Massachusetts, on 12 July 1817. 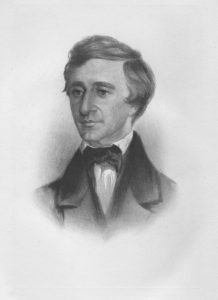 In 1828, after a few years in Concord’s grammar school, Thoreau began attending the Concord Academy, and from 1833 to 1837 he attended Harvard College. After graduating from Harvard Thoreau secured a teaching position at the Concord Center School (public), but he resigned after just two weeks because he refused to use corporal punishment on his charges. From 1838 until 1841 he and his older brother John, Jr., taught a private school in Concord, and in 1838 the two brothers went on a two week boating excursion that Thoreau later memorialized in his first book, A Week on the Concord and Merrimack Rivers, published in 1849. In 1840 Thoreau published poems and essays in the transcendentalist periodical, The Dial, and from 1841 to 1843 he lived with the famous author and lecturer Ralph Waldo Emerson and Emerson’s family (Waldo’s wife, Lidian, and two children) in Concord. In 1842 John, Jr., died a painful death of lockjaw in Thoreau’s arms, and the following year Thoreau moved to Staten Island, New York, to tutor William Emerson’s children and to attempt to break into the New York literary market. 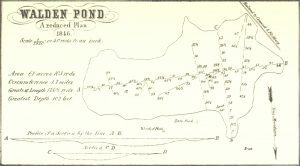 Having returned to Concord, in 1844 Thoreau and Edward Hoar, a companion, accidentally set fire to some woods in Concord when trying to prepare a fish chowder near Fair Haven Pond on a windy day. After leaving the house at the pond Thoreau stayed with the Emerson family again while Ralph Waldo Emerson lectured in England. Thoreau returned to his parent’s home in 1848 and continued living with them as a boarder for the remainder of his life. At about this time he began the routine of morning and evening study and writing, and afternoon walks that were the foundation upon which he may be said to have built his creative life. Thoreau made the first of four trips to Cape Cod in 1849, and he later delivered lectures about his experiences that were posthumously published as Cape Cod. The following year he traveled to Quebec and wrote up that experience in a lecture titled “An Excursion to Canada,” partially published in 1853 as A Yankee in Canada. His famous book Walden; or, Life in the Woods (later shortened at his request to Walden) was published in 1854, and in that same year he delivered his lecture-essay “Slavery in Massachusetts” at an Independence Day meeting of the American Anti-Slavery Society. 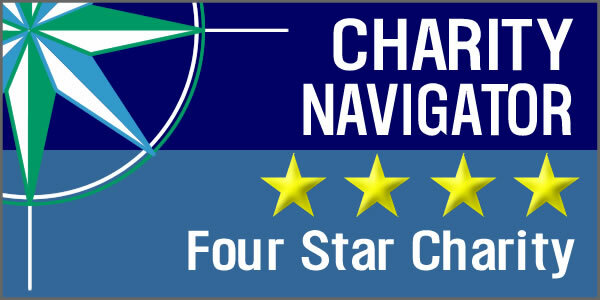 In 1856 Thoreau traveled to Perth Amboy, New Jersey, to survey a large estate and deliver three lectures. While there he visited Walt Whitman in nearby Brooklyn. 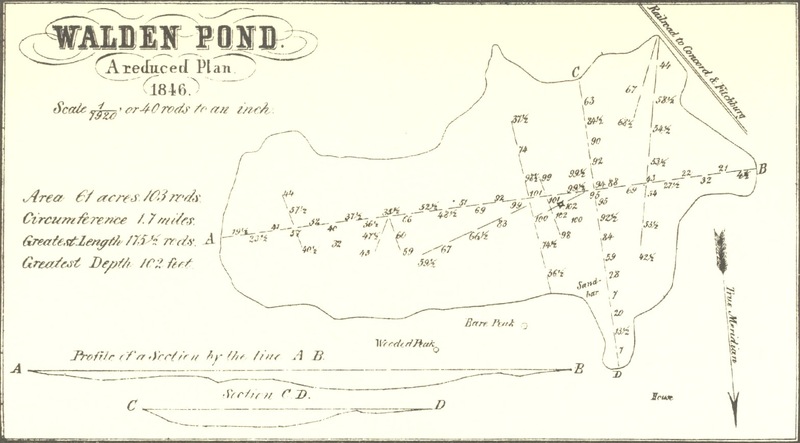 In 1857 and 1858 he visited Cape Cod, the woods of Maine, and the White Mountains of New Hampshire; and in the latter year he published what was to become the second chapter of The Maine Woods, his essay “Chesuncook.” In 1859 his father died, and as a result he had to begin assuming more responsibility of the family’s plumbago business. In October of that year the abolitionist Capt. John Brown raided the federal arsenal at Harper’s Ferry, and Thoreau spoke mightily in defense of Brown’s character — the first person in America to do so. His essay “A Plea for Capt. John Brown” was published and widely circulated in his friend, the famous editor Horace Greeley’s newspaper, The New-York Tribune. The following year Thoreau lectured to his townsmen on “The Succession of Forest Trees,” and his lecture was shortly afterward published and republished, receiving wider circulation than any of Thoreau’s other writings during his lifetime and cementing his reputation as a naturalist. While counting tree rings on 3 December 1860 Thoreau contracted a cold that quickly worsened into bronchitis. His lungshad long been tubercular, and Thoreau was housebound for many weeks. During the summer of 1861 he traveled to Minnesota in a vain effort to recover his health. Arriving back home he began putting his affairs in order and began preparing for publication many of his late lectures. He died of tuberculosis at his mother’s home on Main Street in Concord on 6 May 1862, aged 44 years. 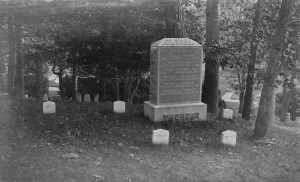 He is buried in his family’s plot near the graves of his friends Nathaniel Hawthorne, Bronson Alcott, Ralph Waldo Emerson, and Ellery Channing on Author’s Ridge in Concord’s Sleepy Hollow Cemetery.